Because short films are often neglected in film festival press and buzz, the next two installments of this series focus on powerful films in short-form packages. First up is an interview with Brian Bolster, a native of Boston and graduate of NYU's Tisch School of the Arts. His film, The Lookout, premiered at Slamdance and recently took home the "Big Sky Award" at the Big Sky Documentary Film Festival. 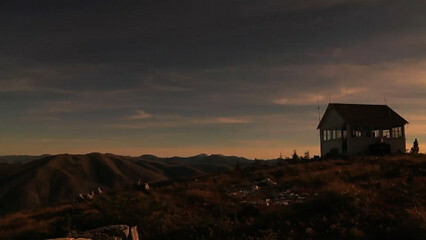 The Lookout is a sixteen-minute documentary about a fire lookout--a term which describes both a person and a place--in a remote area Montana's Flathead National Forest. Lookouts serve to detect and fight wildfires and, despite their ongoing use, seem a thing of the past. Bolster's film is a reflection on solitude and voluntary simplicity in a landscape where, as the lookout puts it, "weather dictates life." Told with stunning cinematography of big skies and mountains, stars and sunsets, it is a carefully crafted film that celebrates quiet and natural beauty. It was your awesome hand letter-pressed card that first led me to want to watch this film, and in the film's press kit, you also included a letter-pressed business card. Why did you make this aesthetic decision to represent a digital film/filmmaker? How does this style of printing relate to your work? Using an older, nearly forgotten art form to bring an element of nostalgia to the collateral materials just felt right, and in the end, I couldn’t be more pleased with unrefined texture of the output and how well both the postcards and business cards represent the film’s aesthetic. 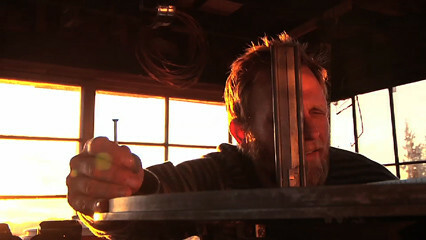 Fire lookouts and letterpress printers are similar in that both can be considered dying breeds of sorts, and I’d like to think that I played a role in preserving both of their crafts to some extent, by making a documentary film about one and successfully promoting that film with the other. Most of my films examine an individual or group’s relationship to structures and/or the environment in which they work, live, worship in, etc. Given that spectrum, I don’t think letterpress print would be the right medium for every project. For me, the film’s aesthetic should really dictate the look and feel of all its ancillary touch points. That said, my next project profiles the owner/operators of an old fashioned mercantile, situated at the end of a long dirt road in rural Montana. It definitely has a rustic feel similar to The Lookout, and I’m certain that letterpress print would, again, yield tools that would both perfectly complement and promote the film. You made The Lookout with a one-person film crew and had to hike twelve miles to and from Thoma Lookout to bring up the equipment for you shoot, not to mention you went without bathing for the week of filming on the mountain. Knowing these challenges from the start, why did you pursue this film? Why did you feel this was a story you had to tell? Fire lookouts and the individuals that staff them are an important part of our nation’s history, and I really wanted to showcase their work to audiences who may not be familiar with their unique, yet often times unnoticed, role in fire management. Additionally, though they remain critical front-line components of our forest system’s detection and prevention of wildfires, they have recently dwindled in numbers, due largely to the proliferation of advanced technologies. Because of this, I knew that I not only wanted to document the working life of a fire lookout, but also play a part in preserving their history in doing so. As far as the physical challenges of getting this film made, backpacking and hiking have been a part of my life for a long time, so the camping and making the two 4-mile one way trips (personal belongings on one, film equipment on the other) up and down the mountain on the front and back-ends of the shoot were definitely much more a welcome adventure than an issue. Also, while not showering for a week may be have been a little unpleasant, that too is something I’ve become somewhat accustomed to over my years of being an avid hiker. The subject of your film, Leif Haugen, is a fourteen year lookout veteran, who chooses to spend solitary summers in a remote post with only a two-way radio as his connection to the outside world. Haugen is surprisingly natural on camera and I imagine there had to be some sort of negotiation for you sharing the small, tiny hut for a week of filming. Tell me about that process. Given his habitation to solitude, how did you achieve the intimate footage in your film, which gives a strong, cinema verite impression? To my surprise, Leif was very comfortable in front of the camera. While we had talked briefly on the phone once or twice about logistics and such, we had never met in person until the first day of shooting. The hike up to the lookout gave us a chance to talk, and Leif was nice enough to accompany me on both trips up and down the mountain, allowing us to get to know each other fairly well in a very short period of time. 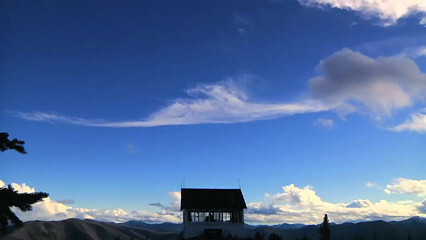 Overall, the weather at the lookout proved to be a real challenge and in many ways ‘co-directed’ the shoot, if you will. We experienced everything from wind and rain to snow and sleet, with one or maybe two warm and sunny days over the course of the week. On the days where the weather was particularly bad, we stayed inside the lookout and shot Leif’s interviews which ended up taking much of our indoor time. Other than that, our days would mostly involve discussing Leif’s plans for the day over breakfast, followed by my doing my best to shadow him as his went about with his routine, whether it was a trip to get water, chop wood or cook dinner. Thoma Lookout is very small and tight space, and that, coupled with the fact that Leif is used to spending so much of his time in complete isolation at the lookout, often times left me with a sense that I was invading his world with my presence. Fortunately, due both to his dedication to his work as a lookout and our mutual desire to share his experience at-large with others, we were able to successfully navigate any discomfort. In addition to being a fourteen-year veteran of the Hungry Horse/Glacier Ranger Districts fire lookout program, Leif also helps train newly hired lookouts as well as restores older lookout structures back to fully operational states. After Leif saw the film screen at the Big Sky Documentary Film Festival, I asked him what he thought of seeing it for the first time in such a large format. Though he was beyond pleased with both the end product and the audience reaction, he also mentioned that the film left him feeling a bit melancholy because he missed his life at Thoma – a clear demonstration to his passion and commitment to his work as a fire lookout. How did you prepare for your week of filming at Thoma Lookout. (I imagine you wanted to get everything in one trip, given the struggles of getting there!) What forms of previsualization did you use (e.g. storyboards, shot lists, etc.) to plan your shoot, if any? Did you plan any sequences ahead of time, such as a stunning time-lapse sunsets or nighttime skies? I did have some pre-visualization of what the end product would look like, but it was minimal since I had never visited this particular lookout and had no idea what to expect other than being told that the views from the site were stunning. I did find some inspiration from the films of Terrence Malick and John Ford’s film “The Searchers” before and after the shoot, and I did have a good idea as to what I thought was important for viewers to experience - but that information was primarily gleaned from Leif’s interview. Additionally, I also knew that I wanted as little camera movement as possible because I wanted viewers to be in and experience Leif’s world. The time-lapsed night time sequence in the middle of the film was the only segment that was preplanned before I left for Montana, and I knew I would include it in the finished film - although, it was pure luck that I happened to catch an electrical storm passing through that particular night. Other than that, everything was shot on site at Thoma. To complete this film, you worked with an editor, Amy Glickman Brown. How much footage did you have to work with for this 16-minute film? What was your process of collaboration for winnowing down the footage? This is the second time I have worked with Amy, and she definitely has a knack for finding the heart of a story. At all points throughout the editing process, I always sense that she is just as invested in the project as I am, and she has never shied away from arguing her points when she feels that I may be making decisions counter to the project’s overall message. I place great value on the pacing of my films, as I find that central in setting the mood for the entire piece. With The Lookout, the only instructions I gave Amy were to edit the film with a pace that was slow, deliberate and with a very “day in the life” feeling. She found the pacing quickly, and with limited footage (only about twelve hours total), was able to add a breadth to the end product that I never thought was possible. In the end, I felt that the final cut of sixteen minutes captured my story perfectly – and I had originally envisioned a total runtime of only about eight to ten minutes prior to our post-production work. 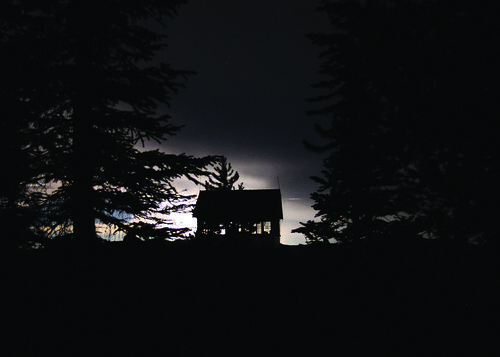 The Lookout is a quiet film, whose soundtrack is composed by the wind, rain, and other elements of Montana's Flathead National Forest and the crackle of the dispatch radios. When and how did you make the decision to not use music? Was this a directoral decision or one you made in tandem with Drew Fuccillo, your sound mixer? If nothing else, I really wanted viewers to experience the same sights and sounds as Leif, so the decision to not use music in The Lookout was indeed a deliberate one. Perhaps I should also credit some of my inspiration in this regard to the soundtrack from Alfred Hitchcock’s film The Birds as well, as I have always admired Hitchcock’s choice of using the sounds of the birds in place of a musical score. However, my choice to use the crackle of the radio was made while shooting at Thoma. I loved how the radio would suddenly disrupt the quiet solitude. The crackle was jarring, and I wanted to incorporate that noise into the film as an auditory reminder that Leif was still connected to the outside world. The budget for your film, $2500, seems fairly modest given the travel that must have been necessary for the filming. Do you often make work with small or micro-budgets? Do you produce work this way for practical, aesthetic, or other reasons? In many ways this shoot was really an extension of a typical backcountry camping trip. The only difference being that I had a camera and tripod with me. Air travel aside, a hiking and backpacking trip is inherently a non expensive outing. Therefore, taking on a film shoot on such a trip definitely assisted in helping me keep costs low during production. While this helped me to keep costs down, it was by no means an aesthetic choice but rather a practical choice. Most of my costs for The Lookout were post-production related. After its premiere at Slamdance, your film went gone on to screen at the Big Sky Documentary Film Festival, where it won the Big Sky Award. Where else do you plan to screen the film at this point? Do you have any long-term plans for VOD or digital distribution? Currently The Lookout is making the rounds on the festival circuit. After the Big Sky Documentary Film Festival, it screened at the Durango International Film Festival and will have two screenings at the Florida Film Festival next month in April and screenings at Independent Film Festival Boston. To-date, there has been some initial interest from a couple of distributors, but I’m definitely still open to exploring and discussing any short or longer-term distribution opportunities which may present themselves. Down the line, I’m also considering packaging The Lookout with some other similarly-themed short films in which I am currently in post-production. In the meantime, I welcome anyone interested in learning more about the film to please check it out at facebook.com/TheLookoutMovie. Made in Knoxville, Tennessee. POWERED BY SQUARESPACE.